Kate Eyre Garden Design is a creative and innovative garden design company working in London. We create beautiful, usable gardens, with a strong sense of colour and style, and for a wide range of properties and budgets. Our planting is original and exemplary, and designed to stimulate your senses throughout the year. We are passionate in our belief that the style of your garden should reflect that of your house, so that life may flow easily from one to the other. We will begin your garden design by meeting you to discuss your intended use of the garden, and your desired look and level of maintenance. We will then create two designs, so that different options can be discussed and evaluated. Once the design is finalised, we will provide a firm quotation broken down for labour, construction, basic materials and plants. Our professional team can offer you a complete garden service, from consultation and design through to installation. If you would like, we can also arrange professional maintenance for your garden. Welcome to Charlotte Rowe Garden Design. Charlotte Rowe is an award-winning garden designer based in London. Charlotte Rowe has designed over 200 gardens in London, the UK and overseas. At Charlotte Rowe Garden Design we offer a full-service garden design consultancy, including garden design, construction management, planting and garden styling. From small courtyards to full-scale rural landscaping, our gardens are recognised for their strong, architectural lines, lush planting and elegant contemporary styling. Charlotte Rowe also specialises in discreet garden lighting and bespoke water features. We work collaboratively with our clients to ensure that the garden design brief is clear and is interpreted correctly in the finished plan. Best of Houzz Design 2018, 2017 & 2016! Creating Inspirational Landscapes in London & across the UK. Tom Howard Garden Design create beautiful, functional and timeless outside spaces, looking after the design, build and planting of your garden. We pride ourselves on helping you through every stage of your garden project, from when we put your dreams onto the drawing board to when you host your first garden party! From traditional country gardens to modern urban spaces, our designs are carefully tailored to your lifestyle and aspirations, whatever they may be. Tom Howard designs gardens predominantly in South London but has had commissions throughout the UK, including a garden designed for Country Life magazine and Cavendish Stone at Chelsea 2011. We are able to travel to Europe or further reaches. 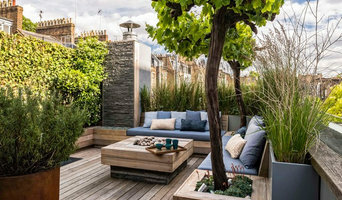 Award Winning London Garden Designer, Creating Inspirational Spaces. Best of Houzz Service Winner 2019! Kate Gould is an award winning garden designer for London and the Home Counties. With almost twenty years hands on experience Kate is regularly commissioned by home-owners, architects and interior designers as well as property developers and commercial clients. In addition to her secular work Kate is regularly seen at the RHS Chelsea Flower show where she has been awarded three gold and two silver gilt medals as well as the highly coveted ‘best in show’ for her inspirational designs. She also finds time to write regularly for the Guardian gardening blog and enjoys regular invitations to speak at Landscape and Design shows, garden schools and other public events. Absolutely passionate about plants and gardening, Kate will work tirelessly to turn your vision from a plan to a reality. 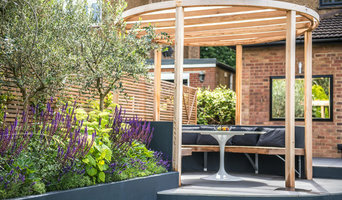 Whether your ideal garden is sleek and minimal or more traditional in feel Kate Gould Gardens will work closely with yourself and your contractors, from plans to planting, ensuring a garden design with stunning end results. If you would like further support after the garden is complete then Kate Gould Gardens can offer an aftercare service through its team of landscapers to ensure your garden stays beautiful and healthy as it moves through the seasons. A beautiful garden does not come about by chance; it requires experienced planning and an eye for design along with good quality plants and skilled plantmanship. For more information on how you can transform your open space into a beautiful outdoor oasis please contact Kate Gould Gardens. Let's Design Your Spring Garden! Jenny Bloom Garden Design creates contemporary and classic gardens for residential clients in London (mainly the boroughs of Islington, Hackney and Camden). I design real gardens for real people, creating outdoor spaces that are both practical and beautiful. At Harrington Porter, we are passionate about designing gardens perfect for entertaining and socialising. Specialising in gardens designed to be an extensions of the internal living spaces - “rooms without roofs”. We love cool seating areas, firepits, hot-tubs, outdoor kitchens - whatever fits your particular lifestyle, so that you can get as much use of throughout the whole year and not just the Summer! We are a small design studio with 15 years experience specifically designing Town gardens for Londoners. We have a vast knowledge of products and materials that are available to make your outdoor space as amazing as possible. Each garden design has a high amount of detail and attention to ensure you have a gardens that can be viewed all year round. At Harrington Porter we appreciate the contemporary style; with a well balanced, simple yet stylish and cohesive design approach. When designing and building, we place as much importance on budget and practical solution as we do the aesthetic, considering expert planning and project management to be just as crucial as beautiful creative design. We pride ourselves in building excellent client relationships, as well as beautifully constructed gardens, and with over 20 years landscaping in London for professionals and families we’re experienced in all areas of our field. Ruth Willmott Associates is one of the most prestige garden designers in the UK, known for their high-end landscape designs and award winning gardens. Based in West London we love to work on beautiful, large-scale residential projects offering a comprehensive design service for all of our clients. We put emphasis on the client and the garden setting, history and architecture rather than any preconceived design style. Our garden designs are contemporary, yet informed by classical architecture and strong geometry with unashamedly ‘pretty’ planting. Book a consultation with us today! Let us design the garden you've always dreamed of. Create Your Dream Garden For 2019! 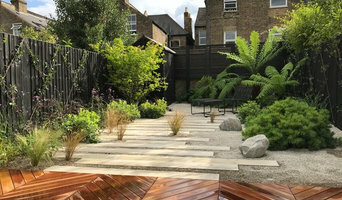 PM Landscapes specialise in garden refurbishment and development, and for over twenty years, have delivered a quality garden design and construction service in the south west London area. Over that time, many garden projects have been successfully completed to a high standard resulting in excellent customer feedback and recommendation. Attention to detail. innovative design and skilled construction are priorities in every garden project we do. We cover all of south west London including Balham, Battersea, Clapham, Earlsfield, Putney, Raynes Park, Southfields, Wandsworth and Wimbledon. Contact PM Landscapes for a free consultation and quote. Hampstead Garden Design is based in north London and was set up by Sarah Oxby, a qualified, experienced and award winning garden designer. Sarah offers a professional but friendly design service and enjoys creating stylish, lasting gardens which are tailored to your taste, needs and budget. Hampstead Garden Design provide a full planning service including layout, hard landscaping and planting design and are particularly experienced in the planning requirements within conservation areas. We work with a handful of trusted landscapers who can be relied upon to create your garden according to our specifications. We then install the planting which is sourced and selected from our network of local nurseries. Georgia Lindsay is an experienced Garden Designer based in London, transforming city gardens since 2010 with a portfolio of work ranging from small domestic courtyards and roof terraces to NHS therapy gardens. Georgia prides herself on having good working relationships with landscape contractors and professionals in the field to produce beautifully well thought-out gardens and ultimately happy clients! "Innovation has been key when designing for small urban gardens. Space is at a premium therefore ingenuity is essential in forming multi use areas. My design ethos has always been to create harmonious gardens which suit the space and budget. With the use of distinctive lighting and expert planting I love the challenge of transforming even the smallest of spaces." "Once I have gathered as much information form the client, I then produce initial drawings which can be perfected along the way. Once the design is established a final set of visuals and technical drawings are produced, this is supported by mood boards, a planting plan and a lighting plan. At this stage I can recommend one of my landscaping contractors I regularly work with or I am equally happy to collaborate with the clients chosen landscapers." Creating and nurturing beautiful gardens. Garden Club London has what we believe to be one of the most comprehensive and best value professional garden and landscape design services in London. Unlike many other landscape companies we have an Award-winning designer involved at every stage of your design and an accredited landscape team. All working together as one, a team of specialists dedicated to delivery of the very best results for your garden. We offer a bespoke garden design and build service. When the process is complete, you will have complete peace of mind of our warrantees and follow up maintenance service exclusively available to our design and build clients. Give us a call today to discuss your next garden project! Based in North London, Belsize gardens specialises in residential design and build projects in London and the south east. With project locations ranging from Hampstead and Belsize Park, to Bromley and Beckenham, Belsize gardens offers a garden design and landscape service that gives you the highest quality and service from concept to completion. We offer a service that collaborates fully with our clients, understanding their needs and wants, to ensure that the design brief is clear and that the finished product more than meets requirements. While our gardens may differ in terms, of size, shape, style, and usage, all of our gardens share Belsize Gardens’ design ethos. Creating visually stunning gardens with a strong sense of functionality. We aim to reflect your personality and style in your garden. Basing designs around your specific needs, forming strong visual links between the inside and outside, creating a garden that suits your lifestyle and local environment. Belsize gardens also works alongside other garden designers to interpret their designs and creating beautiful gardens for their clients. Belsize gardens is run by Miles Raybould, who has been designing and building gardens around London for 10 years. Having previously worked as a contracts manger for a large London based landscaper, his love of design led him to to study at the London College of Garden Design under some of the biggest names and best teachers the industry has to offer. With this experience Miles and his team look to offer you a bespoke service that creates a space for you to enjoy. A landscape architect will handle all design, supply, construction and administrative elements of your garden or landscaping project. They will take into account your needs, the London climate and unique advantages and constraints of the landscape architecture. Typically, work will be based on ecological and environmental considerations, and a garden will be planned not only to look its best but also to facilitate future maintenance and growth so that it continues to flourish. A London landscape architect can also design any outdoor buildings that are to be featured in your garden. Everything from design blueprints through to the plants themselves should be provided by your London landscape architect. If there is other architectural development taking place on your site, bring the landscape architect in as early as possible. The expertise a landscape architect can apply to understanding your space and the natural environment could be vital to planning your project. Let your London landscape architect work closely with your architect, surveyor and any other contractors in order to develop landscape architecture that works in accordance with any other construction. This is important from a design perspective as well as on a practical level – changes to the grading of a landscape and modifications such as drainage can have serious implications on the viability of your land for extensive building and structural works. In order to resolve any planning permission issues, submit all applications for building and landscape architecture together, well ahead of the project. The scope of garden designers, or landscape gardeners, is often more limited to green space projects which will optimise your existing outdoor space rather than altering the landscape architecture as a whole. Whereas landscape architects specialise in the structural aspect of garden planning and building, garden designers in London will carry out projects that are of aesthetic and horticultural value. Landscape gardeners will make your garden the best version of itself with features such as walkways, patios, water features, fences and lighting, as well as choosing the right plants, trees and flowers. The practical role of a garden designer may vary by firm – some offer just the plans, requiring a separate contractor, while others fulfil the project in its entirety, from conceptualisation of the landscape gardening to construction. Don’t be put off by the former if you happen to find a good London garden designer that you like – he or she will have local industry connections to introduce you to quality, reliable gardening professionals with whom they have existing relationships. Here are some related professionals and vendors to complement the work of landscape architects & garden designers: Landscape Contractors, Garden & Landscape Supplies, Tree Services, Lawn & Sprinklers, Decks, Patios, Sheds & Summerhouses. How do I choose landscape architects or garden designers in London? When choosing your London garden designer or landscape architect, be sure to research their qualifications and look at examples of their previous work. A portfolio of previous landscape architecture or garden projects is important to ascertain both their credentials as well as their style. Once you have shortlisted or chosen your architect or designer, an on-site meeting is essential so they can see exactly what they’ll be working with. Stay briefed on all plans and developments, both before and during the project as a plan you approved previously may change during the course of the project. Be very clear on your budget – just like plans, costs may alter while work is underway so ensure your professional keeps you informed and does not incur additional expense without approval. If you are open-minded and budget-conscious, consider approaching new graduates keen for experience, who may negotiate a lower rate than more experienced professionals. How long have you been landscape architects or garden designers in London? Find a landscape architect or garden designer on Houzz. Narrow your search in the Professionals section of the website to London landscape gardeners. You can also look through London photos to find a garden you like, then contact the garden designers in London who worked on it.